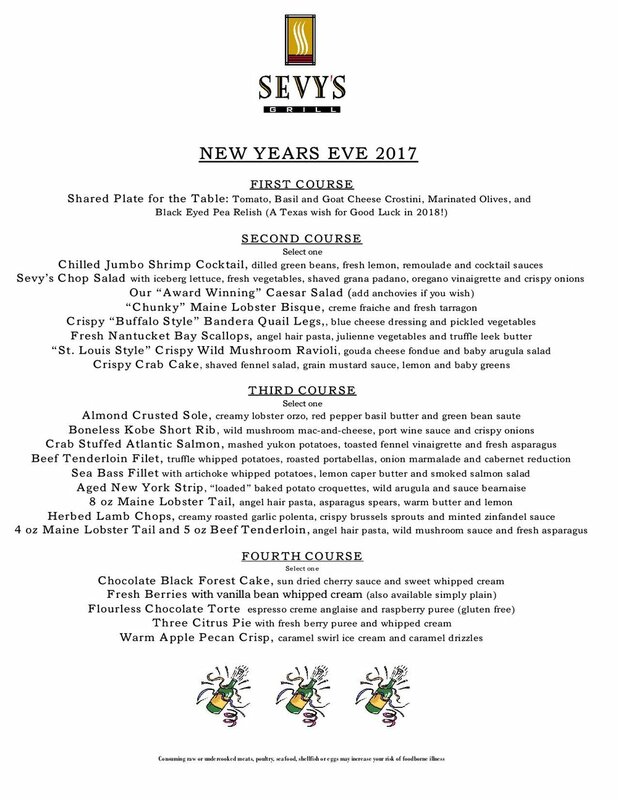 Whether it’s been a great year or a year to forget, come toast with us at Sevy’s Grill on Sunday Evening 12/31, and celebrate New Years Eve! We’ll be offering two different menus at two different prices, with several choices for all in each course. From 5pm - 645pm we’re offering a Three Course Menu (available for $55). Throughout the evening we’re also offering our Four Course Menu (available for $79), featuring Nantucket Bay Scallops, Kobe Short Ribs, Fresh Maine Lobster and more! Cocktail and wine specials will also be available. Each table will also start with a Complimentary Black-eyed Pea Relish as a good luck wish for the New Year! We will be closed, Monday January 1st, then reopen on Tuesday, January 2nd at 4:00 PM. Only available during the early seating between 5:00 - 6:45 PM!